LIFEFORCE FOCUS. Alltech's LIFEFORCE is a daily nutritional powder supplement that benefits all horses at every stage of life, whether they are in the early developmental stages as a foal, breeding stock, pleasure, performance working through the demands of competition, or well into retirement. LIFEFORCE helps ensure that the horse maintains healthy fermentation while being fed a proper diet. The result is well-balanced microflora in the gastrointestinal tract which enables horses to extract the maximum nutrients from the diet. LIFEFORCE is also essential in helping to maximize beneficial fiber-digesting bacteria in the gut, which will enable your horse to extract the maximum nutrients from all feed sources and create an ideal digestive environment. Another particular advantage is the inclusion of mycotoxin adsorbents, which are used as part of a strategy to protect horses exposed to contaminated feed. 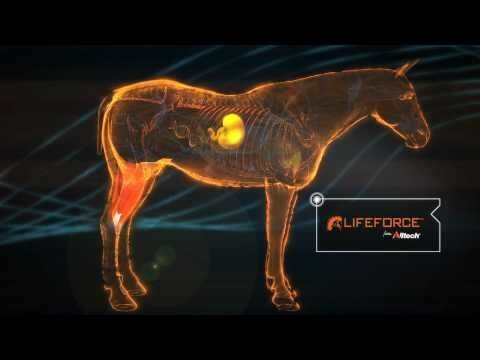 The LIFEFORCE range consists of more than 30 years of Alltech's scientifically-proven, fully traceable technologies and is backed by 8 years of unique Nutrigenomics expertise. Each product contains five cutting-edge ingredients Yea-Sacc 1026, Bioplex copper, manganese, zinc and Sel-Plex that fully comply with competition standards, where consistency and safety are a top priority. The LIFEFORCE Focus blend is specifically designed for less active horses or those with a lot of grazing time. Works to provide preventative care for equine companions. Directions: 2 scoops daily. 1 oz scoop enclosed. 5 kg = 90 day supply. Shop everything for horse & rider on Equestrian Collections. Shop over 200 brand Collections on Equestrian Collections!